Kurt was an avid collector, particularly fond of textiles and blankets. Having traveled to the southwest to visit the Hopi, he acquired a large number of antique Navajo blankets of extraordinary beauty and significance. He discussed their use and meaning in his lectures, and on chilly nights at the Diamond Sufi Ranch he'd sleep warmly beneath them. Read more to see some examples from his collection (images courtesy of Ishi von Meier, Kurt's grandson). Kurt was a collector. 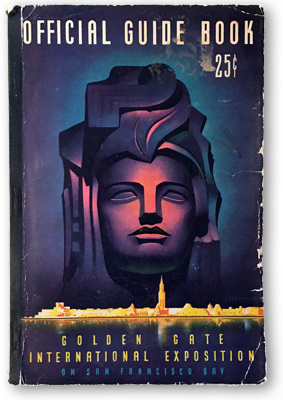 He'd find objects and relics, then place them in containers and boxes which he'd squirrel away in closets, cabinets and hiding places known only to him. From time to time he'd pull one out and talk about each item so contained. 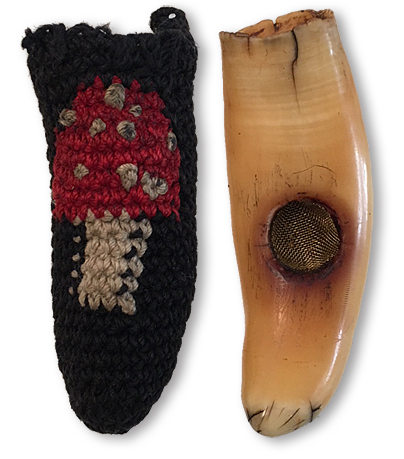 Some treasure boxes were filled with Native American artifacts, others with bones and ivory. Every item had a story. This box held horns, mostly. For a closer look at the contents, read more. 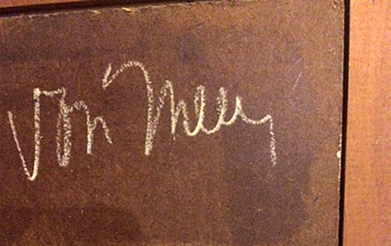 Kurt was Ken Magri's Masters Degree advisor in the late 1970s at Sacramento State University. Ken went on to enjoy a career of art, photography, teaching, writing and commentary. 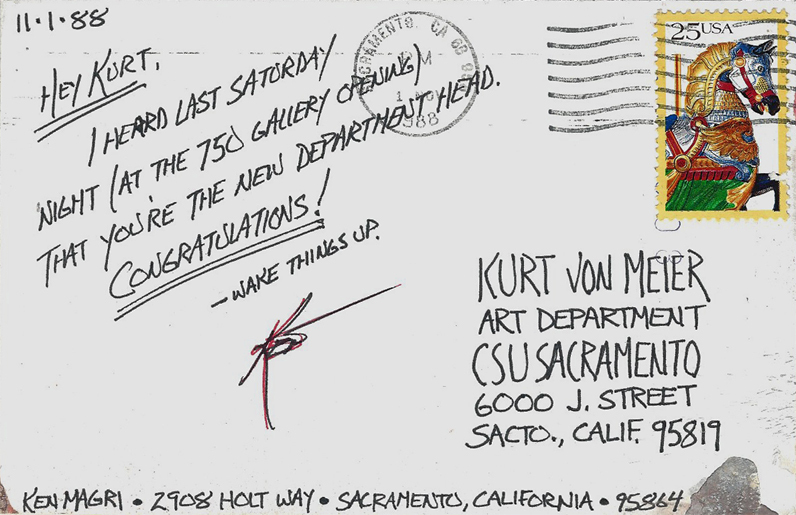 When Kurt was selected as the head of the Art Department in 1988, he received this postcard from Ken. (Ken has recently contributed his recollection of Kurt). Want to spend a while hanging out at the Diamond Sufi Ranch in the early-seventies? Here's a recording that allows you to do it; Kurt often put a reel in his Nagra, set it to record and let it run. Begin the audio, lie down on the floor with a comfortable pillow behind your head, close your eyes and join the ranch family and guests as they hang out on the deck in the grove of timber bamboo, smoke, eat, laugh and play music. Visting the ranch, Harish, an Indian musician and singer, serenades the group while the ranch flute, as Kurt says, "finds" a player. Drums get played, fruits get eaten, pipes get smoked. Just another day in paradise. Audio runs about 30 minutes. 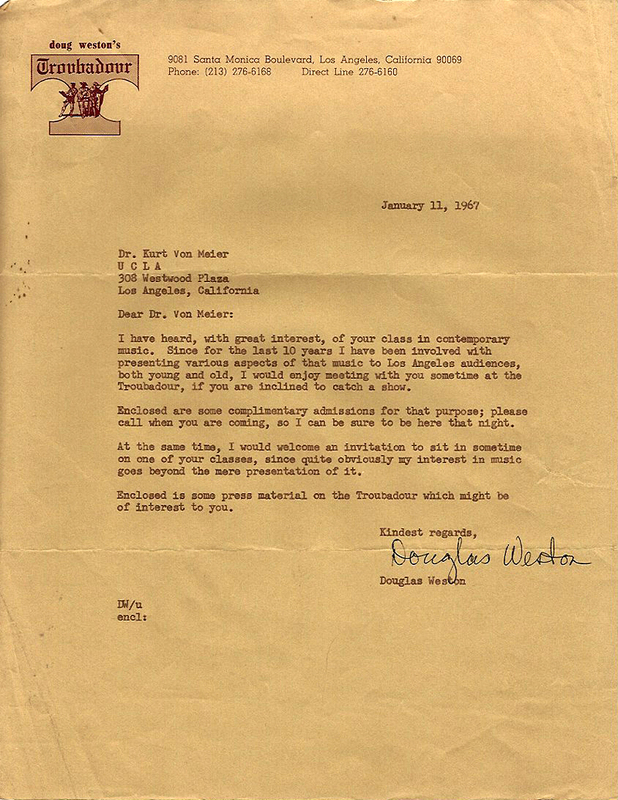 Kurt's class lectures on Rock & Roll got the attention of Doug Weston, owner of the famous West Los Angeles club Troubadour. 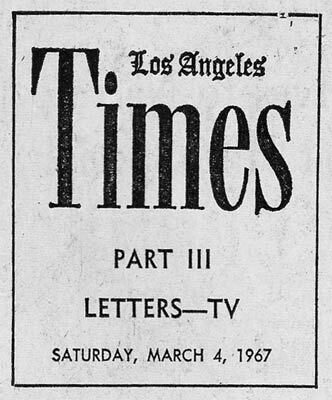 Dubbed in the local newspaper "The Professor of Rock," Kurt was invited by Weston in January of 1967 to join him at a club performance. 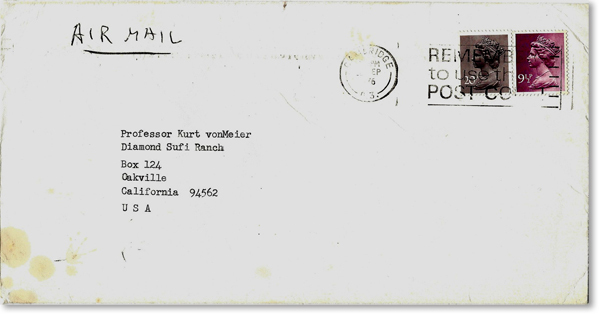 The photos and thoughts expressed on this website about Kurt's Diamond Sufi Ranch of the 1970s prompted Kurt's dear friend Joseph Duane to pen his own memories of that magical place (with some additional notes from ranch family member Cliff Barney). 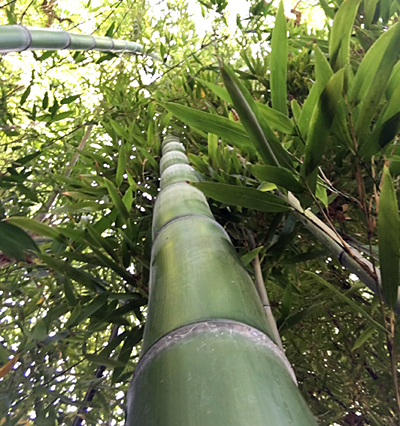 For example, about the bamboo, Joe writes, "'Harvested stalks were put to innumerable uses around the ranch, and Kurt’s friend Super Dave crafted lovely shakuhachi style flutes from root ended culms. The bamboo inescapably lent an 'oriental' air to the surroundings, and Kurt and his companions were naturals for the roles of the Taoist “Seven Sages of the Bamboo Grove'." Since its launch in August of 2017, KurtvonMeier.com has attracted visitors globally. This map shows the countries where visitors are located. Of these, the vast majority are located within the United States (in black); the lightest gray indicates zero visitors. Other countries with significant numbers include Canada, Thailand, The United Kingdom, Germany, Spain, Australia, Italy, France and New Zealand, but through searches, Facebook and emails, knowledge of the site is spreading every day. The website is well-indexed by Google, and public searches about specific artists or subjects are returning links to Kurt's articles. Who knows where this will lead, but the goal of making Kurt's thoughts and the story of his life available to the world is being accomplished. 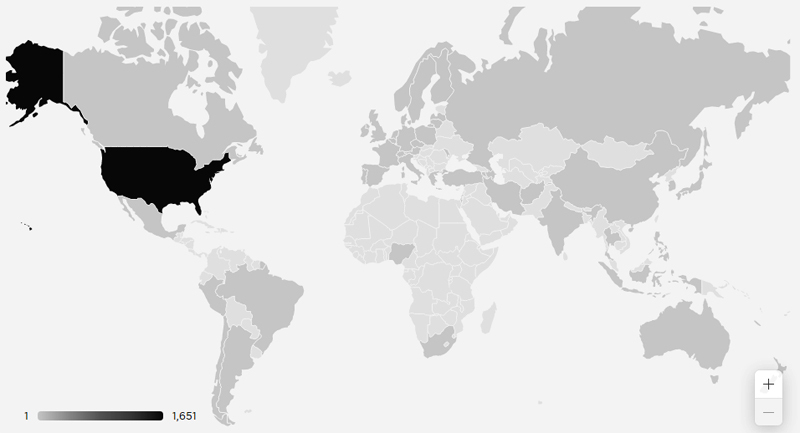 One of the effects of this website is viewers around the globe. 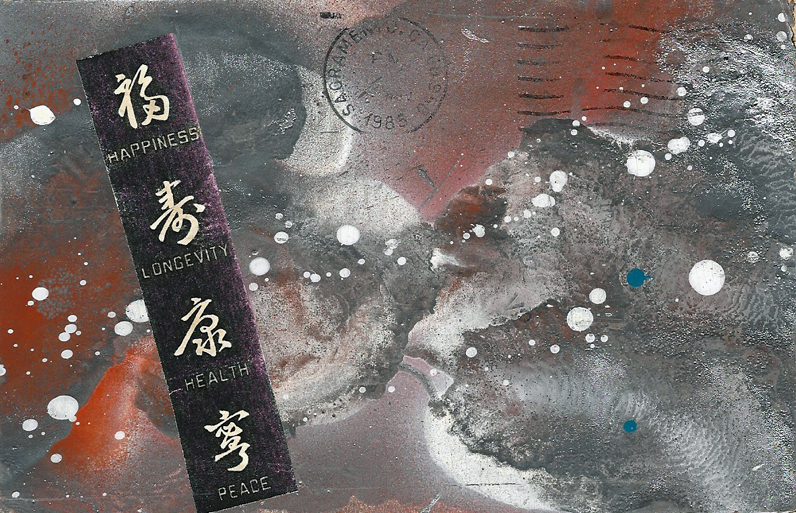 Accordingly, a gentleman in New Zealand by the name of Xuan Titman made contact and said he had a painting his mother told him was given to her by Kurt. He sent some photos, front and back. His mother was studying fine arts in the early 1960s, though died twenty years ago. 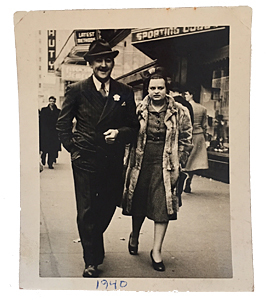 Kurt taught in New Zealand in the early 1960s for two years as a visiting professor at the University of Auckland, and a web search turns up evidence of an art exhibition in which a painting by Kurt was listed. This could be it! "The Ceremony of the Black Crown or Vajra Mukut, which His Holiness alone can perform, transmits the energy and intelligence of the awakened state of mind." So reads a sentence from the program booklet provided for attendees for an empowerment ritual performed by His Holiness, the XVI Gyalwa Karmapa. Kurt von Mieir would not have missed it for the world, and along with a retinue of Diamond Sufi Ranch family members joined the large crowd at Fort Mason on October 13, 1974. 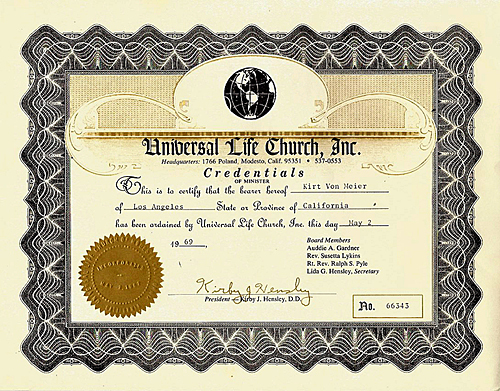 Aka: Dr. von Meier, Buddy Meier, Kurt Eugene von Meier, Kvon Meier, Karma rDorje Wangdu. This weathered portrait (circa 1975, based upon the hairline and facial hair) of Kurt by an unknown student-artist was found unceremoniously tucked away in a moldering manila file folder. More on Jose Que.